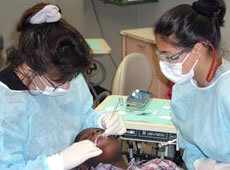 The two-year program is based at the J.Hillis Miller Health Center in Gainesville and at the College of Dentistry’s NCEF Pediatric Dental Clinic in Naples, Florida. 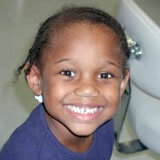 The program leads to certification in pediatric dentistry. Didactic and clinical training develops the skills required to comprehensively care for the oral health needs of healthy children and children with special health care needs. The didactic curriculum includes advanced courses in oral biology, pathology, pediatric medicine, biostatistics, growth and development, pediatric dental medicine, physical diagnosis, practice management, sedation and orthodontics. Residents also participate in seminars on treatment planning for comprehensive care, diagnosis and treatment of developing malocclusions and pediatric dental literature review. The clinical curriculum includes experience in comprehensive preventive and restorative care, hospital-based dental care in an operating room setting, sedation and monitoring in the dental office setting, treatment of patients with oral facial anomalies, diagnosis and treatment of developing malocclusions and emergency dental care. Consultation and dental care are provided to patients referred from Pediatric Cardiology Hematology/ Oncology, Nephrology and Neurology Clinics and from the Bone Marrow Transplantation Unit. The residents participate in a four-week anesthesiology rotation at UF Health Shands Hospital and also rotate through subspecialty Pediatric Medicine clinics at UF Health Shands Hospital and Healthcare Network of Southwest Florida in in Naples. A clinical or laboratory research project is required and a limited teaching commitment is required in the second year of the program. The program meets requirements set forth by the Council on Dental Education and graduates of the program are eligible for examination by the American Board of Pediatric Dentistry. We strongly encourage you to visit “Residency Programs” at the American Academy of Pediatric Dentistry website, which provides important information about our program.